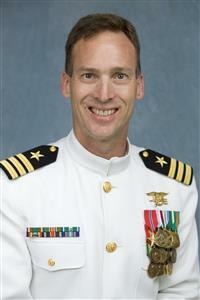 Commander Matt Shipley, graduated from Navy recruit training in January 1985, Electronics Technician "A" School in October 1985, Naval Academy Preparatory School in 1987 and the United States Naval Academy in 1991. Shipley's tours include Assistant Platoon Commander at SEAL Team EIGHT, test article Officer-in Charge of a Mark V Special Operations Craft (SOC) at United States Special Operations Command, Operations Officer at Special Boat Unit TWENTY, Mk V SOC Liaison Officer to Special Operations Command European Command, Naval Special Warfare Task Unit (NSWTU) Commander for a Mediterranean Amphibious Ready Group, and Platoon Commander at SEAL Team EIGHT. As a reservist, Shipley served as Executive Officer of Navy Reserve Naval Special Warfare Group TWO Detachment 309, as Executive Officer of SEAL Team THREE deployed to Fallujah, Iraq in 2006, as NSWTU Commander Manda Bay, Kenya in Oct 2006 - Mar 2007, and as the Commanding Officer of SEAL Unit EIGHTEEN in Little Creek, Virginia from Dec 2009 - Dec 2011. He retired from the US Navy in Jan 2013. Shipley has a Bachelor of Science of Economics and General Engineering from the United States Naval Academy, and a Masters of Theological Studies with a Biblical Studies concentration from the Reformed Presbyterian Theological Seminary. He has completed Basic Underwater Demolition/SEAL school, United States Army Ranger school, Military Freefall school, Air Command and Staff College Joint Professional Military Education (IPME) and the Joint Staff College's Advanced JPME. Shipley's awards include Bronze Star Medal, Meritorious Defense Service Medal, Joint Service Commendation Medal, Navy Commendation Medal, Navy Achievement Medal and various unit, campaign and service awards. As a civilian he is a General Electric Six Sigma MBB Process Expert, ISO 9000 auditor, Constitutional Lecturer and published author. Join us Thursday, November 15th for this engaging lunch talk! NO Club Meeting - Happy Thanksgiving! Anesthesiologist and expert witness for the U.S. Department of Justice in criminal court cases involving prescription pill abuse cases. No Club Meeting - Happy New Year! LOCATION CHANGE - Hampton High School - Meet our Interact Club! Beattie Tech Career Center 9600 Babcock Blvd. Grab a bite to eat at Pasquale's at noon instead! Club Meeting - Back at Wildwood! Bring your Spring Service Project ideas! Let's put some action behind our motto: Service Above Self!